This is our review of the Virgin Trains lounges at London Euston and Manchester Piccadilly railway stations. Last week Rob sent me up to Manchester to check out the new Crowne Plaza and Staybridge Suites that have just opened, reviews for which will be published in the next few days. 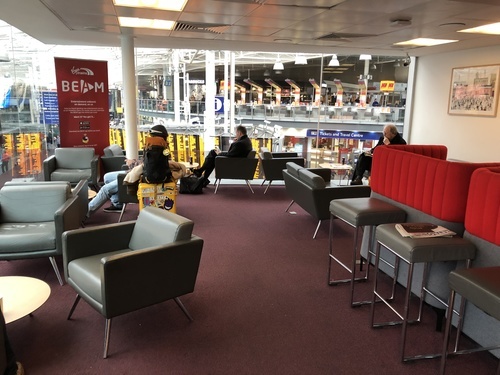 Since both Manchester Piccadilly and London Euston also have Virgin Trains First Class lounges, and the HFP travel policy seemed to allow expensing First Class rail travel, this seemed like a good opportunity to try them out and compare. It was very crowded when I got in at 10:30 and I struggled to find a space to sit until I walked around the corner. A few groups soon left which opened up a few more tables and chairs, although it remained busy for the entire time despite it being mid-morning. The cafe-bar had a selection of fruits, muffins and some cookies, as well as self-serve tea, coffee and soft drinks. They also have barista coffee from 9am to 5pm. Sadly there were no savoury items at this hour – a shame for those of us who are less keen on sugary snacks. The muffins and cookies didn’t look like anything to call home about – it would have been nice to have some slightly more sophisticated pastries, for example. Newspapers available were The Times and the Financial Times. 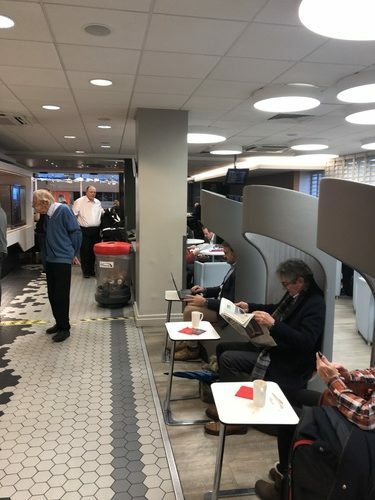 The Virgin Trains First Class lounge at Manchester Piccadilly is a smaller affair than the one at London Euston. In reality, it is not much more than a room with floor to ceiling windows on two sides overlooking the station concourse to make it feel a lot larger than it is. 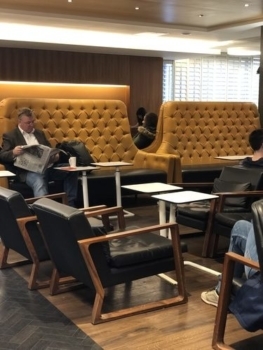 Unlike the Euston lounge the furniture was very generic and corporate-looking, and did not have the same artisanal coffee-house feel. Despite this, however, it was a lot less busy with plenty of available seating and probably an appropriate size for the location. I must admit that I arrived around 11am, however, which I suspect is very very off-peak. There was no cafe-bar here, with only a side-table featuring individually wrapped muffins, cookies and several savoury options that weren’t available at Euston including crisps and pretzels. A bowl of fruit and a small fridge with orange juice and some cans of Pepsi accompanied it. I suspect there is a selection of teas and coffees though I did not seek these out and forgot to take a photo! Do not, however, expect the same kind of service as in London; there are no other staff other than the one to check your ticket and there is definitely no barista-made coffees! The Virgin Trains Euston lounge is, in general, very good by rail lounge standards despite the lack of space. It was slightly disappointing that even close to lunch time there were no savoury food options. The barista coffee bar is a nice touch. The only real issue is with capacity – I cannot imagine how crowded it must be at peak times given it was full at 11am on a Wednesday morning. The Virgin Trains lounge at Manchester Piccadilly is a little more disappointing. It is very small, which is not necessarily a problem, and would benefit from a slightly less corporate-looking design and a barista. 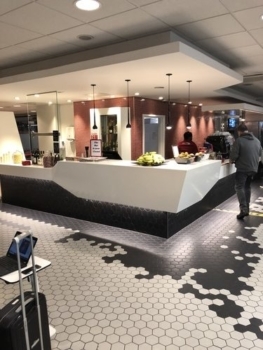 Of course, both lounges pale in comparison to airline lounges which offer a greater selection of amenities, food and drinks. Even the most dismal airport lounges at London airports are better than the Virgin Trains offering at Euston, and the relatively poor lounges at Manchester Airport outshine the Piccadilly rail lounge. On the positive side, Virgin Trains does not exclude customers travelling on First Advance tickets – which can be had for little more than a standard fare – from accessing the lounge so it makes sense that they are trying to keep costs down. 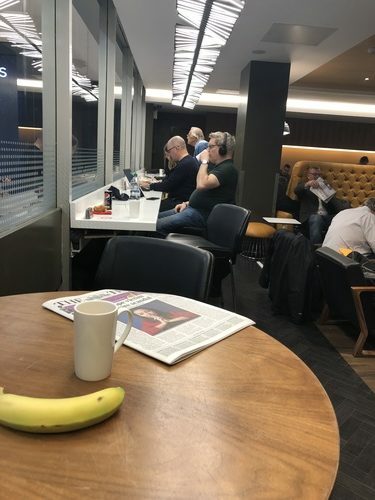 The real question is whether – with First Class Anytime tickets selling for as much as £242 each way between London and Manchester – the lounge should be more restrictive in who can get access and more upmarket in terms of what is offered. Where can you fly these days with Virgin Flying Club miles? The virgin trains lounge at Euston is of course simply a slum. Its usually packed, filthy and tended by insufficient and regrettably sometimes rude staff. The Birmingham New Street one is like a ghost town and slightly pointless when there is so much at Grand Central and the one at Birmingham International is often the best, for a cup of tea and a packet of biscuits whilst you await your delayed of cancelled train to Euston. That said, its only 73 minutes with 3 trains allegedly per hour. How long does it take to get from say Victoria to Barnet?? This article has cheered me up because I always thought I was missing something by not being able to enter the First Class Virgin Trains lounge at Euston (usually due to too short a journey on too cheap a ticket :-)!! Several of the smaller lounges – which have different and easier access rules – at non-London and non-Manchester lounges are a relief to find where they are, tended by nice staff and quite pleasant. But based on the information in this article I will never press my nose to the window of the London Euston Virgin Trains lounge again and envy anyone inside. I think the lounge at Euston is busy because people (including me) travelling on advance first tickets arrive in extremely good time for their train – often 30 minutes early, to allow for delays on (in my case) SWR or the tube. So effectively you have two trainloads of people in the lounge for both Birmingham and Manchester trains. As I never buy open first class tickets, I can put up with that. It’s a good way to get hold of a copy of The Times in the morning as they are not always available on the train. And at Manchester there is no need to use the lounge as there are usually two trains on the platforms so you can get straight onto your train even if you arrive at Piccadilly 25 minutes early. Plus the fact that the platforms of the departing trains at Manchester are shown well in advance of departure rather than a very few minutes before as is the case at Euston. Hi – have you seen the app that lets you see the Euston platforms long before they go on the board ? I find it very accurate and use it on a very frequent basis – only tends to thrown by last minute changes to arrivals or severe delays. It’s linked in some way to the train management systems. Because of the extremely late display of platforms at Euston I’ve frequently come very close to missing the train when I’ve had luggage with me. And to add to my other comment, if anyone from Virgin Trains is reading this then over and over again at different times of the day, on different days of the week when travelling on Virgin Trains from Euston I’ve found the so-called Virgin Help desk to be rude, lazy, useless and about as good for information as a chocolate teapot is for tea. The Virgin trains are very good to travel on but the “ground” experience at Euston, despite the presence of these so-called information people for Virgin, is miserable. You should get the platform number from realtimetrains.co.uk and be a few minutes ahead of those relying on the in-station info. Sounds about right to me Peter – that’s why I was there early too! The lounge simply isn’t big enough for the amount of people it caters for. OT – has anyone had the £5 SS credit buying capsules at Nespresso Cheapside? Or is it triggered only by spend at the cafe? The address on the shop small map is 100 Cheapside, which is the address of the cafe not the store. We’re travelling UC on Virgin from HKG to LHR in January, then looking to catch a Virgin train from Euston to Liverpool afterwards. Would we be eligible for lounge entry at Euston and/or an upgrade to 1st class on the train journey ? This would be a weekday around 9am. If you are asking whether flying UC on Virgin Atlantic gives you either the right to an upgrade on Virgin Trains or access to the Virgin Trains Lounge,. I’ve certainly never heard of that being a benefit of UC travel. Lol where did you come up with this idea? Despite the common ‘virgin’ in their names these are totally separate companies. If you want to travel on the train in First you will have to buy it – It can be quite reasonable if bought in advance and it’s not peak period- soon evident from the drop in pricing in the search engine. There are no onboard cheap upgrades during the week but there are at the weekend because (a) trains are less busy and (b) the much more restricted catering. If yiu book via the virgin trains website / app then you can get some flying club miles though. There are quite a few discount codes for Virgin trains around regularly apparently, some has been posted on here. Virgin Red app usually has a 20% discount for first time users. Nice article Rhys, and good to see some additional coverage of the more ‘mundane’ forms of transport. Whilst there are (as far as I know) no lounges there, a review of Victoria Coach Station would be interesting to read. Great article. A few more comments from a ‘frequent flyer’ through Euston. – at times the loos are dire – especially when either the gents or ladies are out of order and the remaining loos and showers are re-branded ‘unisex’ – this happened for about 8 weeks earlier this year. Neither Virgin nor Railtrack (who manage Euston) could decide who was responsible for repairs. Railtrack haven’t managed Euston, or any other main station, for 16 years. It’s Network Rail these days. 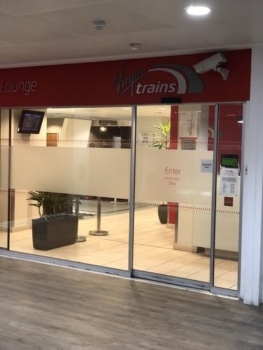 Wasn;t Virgin Trains selling off a number of its smaller lounges? Wolverhampton might have been one of them. But now I come to think of it, it won’t be the only one. Surprised that the main advantage of the Euston lounge hasn’t been mentioned, namely that the alcoholic drinks are completely free to passengers with Traveller status. Yes but its the same drink that is offered for cash – it depends on what one is expecting. There are no free spirits – apart from Dickie himself of course and I’d rather wait for the train and have a beefeater or 2. Head up to the Doric Arch and sweat and stand, but they do do champers by the bottle dirt cheap and also stella or san miguel (?) There are also half a dozen acceptable places within 5 mins walk of the platforms out of the station. The cat is also out of the bag – real time trains is the platform answer, but only the web page not the app – and you can try to beat me to my seat…….dream on!! Rob – this actually reminded me of your recruitment plans, how are these going? It’s been a month since applications closed and you keep silent on the result… Is Rhys staying full-time now or are you going to unveil new Anika at the Xmas party next week? Long story. Rhys is great but on graduating it is better for him that he gets a proper job! There was one person (out of almost 100) who applied who writes for a similar site. I ran with them exclusively for a couple of weeks, as I liked their work, but they live outside the UK and whilst they were willing to commute it ended up being too tricky. I went back to the other 90+ CVs and there are interviews going on at the moment. What is interesting is that each person can bring something else to the role. First person I saw has great experience in video work. Second person has a sales background and would improve the way we sponsor our events. Others will bring other skills. Won’t be an easy choice. Great, thanks for a detailed answer. Fascinating insights. Having been involved in recruitment recently I completely understand the frustration of not being able to find a person who embraces all the relevant skills in one! Maybe you will find a potential candidate tonight! Don’t forget that if you’re gold with VS, you also get entry, regardless of class of travel. Do you? It was never the case with Virgin Trains East Coast before they became LNER. Then again VTWC was always more ‘Virgin’ than VTEC. 1500-1900 on a Friday is not peak. They trialled removing the restriction over summer to help balance the loads over the day better, found that overall everything including revenue across the whole day increased so they have retained the removal of 1500-1900 on Fridays being peak. That’s for tickets, not lounge access. First class ticket gets lounge access – period!